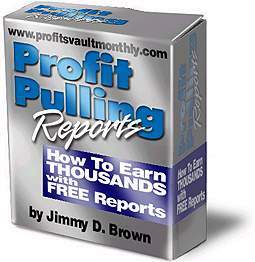 iProfit eBook Package - How to Write Profit Pulling Reports! "How to earn thousands monthly with your own free reports..."
How to create "Profit Pulling Reports"
this course and keep every penny you bring in. * How to write your own *exclusive* free reports. * How to reap incredible profits from them. GUARANTEE: If Profit Pulling Reports is not everything that I say it is and you are not completely satisfied with it, then I will refund every penny of your money with no questions asked. Copyright (c) 2006 by Jimmy D. Brown.